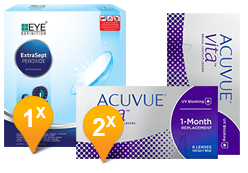 Introducing the ACUVUE VITA monthly contact lenses that provide reliable, superior overall comfort - all month long! Are your monthly lenses not comfortable enough? 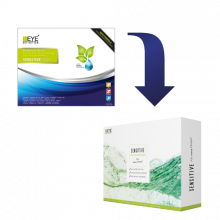 Probably you use eye drops to rehydrate them or you take them out too often to reduce discomfort. 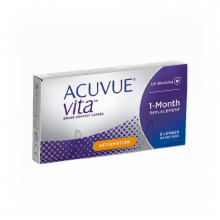 If this sounds familiar, then Acuvue Vita with HydraMax technology can be a solution! 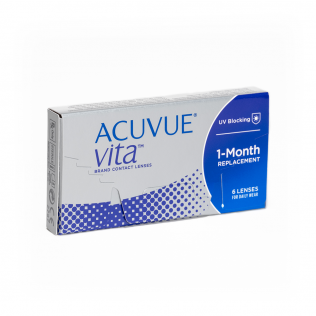 The Acuvue Vita contact lenses are the first ever month lenses from manufacturer Johnson & Johnson. Thanks to HydraMax technology they offer superior comfort throughout the month. Discover the difference of the HydraMax Technology. It not only helps to maximize hydration throughout the lens but also to maintain it. That's why the Acuvue Vita provides a lasting comfort, throughout the month. 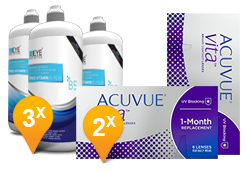 Furthermore, the Acuvue Vita contact lenses contains a Class 1 UV filter to protect your eyes better against harmful UV rays. Johnson & Johnson are so convinced that you are going to be satisfied from your ACUVUE® contact lenses, that they offer a satisfaction guarantee. In case you are not 100% satisfied from your lenses you will get reimbursed by Johnson & Johnson. 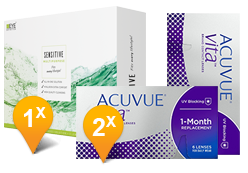 Buy your Acuvue Vita (6 lenses) daily lenses at Lensonline.be and assure yourself of the best price / quality ratio. Our employees are ready to answer all your questions and if possible to advise on your contact lenses, liquid lenses and lens use. 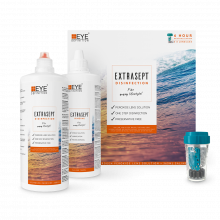 You will find on Lensonline.be all major brands of contact lenses and lens solution such as CooperVision, Acuvue, AOSEPT, Biofinity, and much more! ACUVUE®, 1-DAY ACUVUE® MOIST, ACUVUE® VITA TM ACUVUE OASYS® 1-Day and LACREON® are trademarks of Johnson & Johnson Medical BV/NV. All ACUVUE® Brand Contact Lenses have UV Blocking to help provide protection against transmission of harmful UV radiation to the cornea and into the eye. UV absorbing contact lenses are NOT substitutes for protective UV absorbing eyewear such as UV absorbing goggles or sunglasses because they do not completely cover the eye and surrounding area. You should continue to use UV absorbing eyewear as directed by your optician. Onbekend, onbemind ? Maar wat is deze lens comfortabel! Ik heb alle concurrenten gehad, maar deze lens blijft comfortabel zelfs na een maand te dragen. Ik kan deze lens aan iedereen aanraden.